(Editor’s note: This week for Throwback Thursday, we take a look at Columnist David Williams’ article from April, 2011. If you have ever wondered what goes into the structures around an airplane engine, the answer may surprise you. 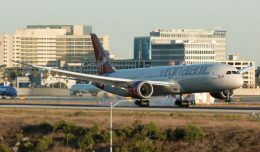 Looking at a modern jetliner, one can easily pick out the classic trademarks that give it the ability to achieve such great speeds; the gently tapered surfaces and retractable landing gear that reduce aerodynamic drag, and wings and tail feathers that are swept back to reduce mach drag up at altitude. The jet engines powering these aircraft enable these birds to fly at speeds up to 90% of the speed of sound. But rarely is much attention paid to one of the most important design aspects, the enclosures of these turbofans — the cowlings. The earliest aircraft, including the Wright Flyer, were often powered by low powered liquid cooled gasoline engines. The heat generated by the engine was transferred to the radiator, which then expelled it into the atmosphere. Though the liquid cooled engine was superior in design, the weight and simplicity and reliability of the air-cooled engines made them prevail from the 1930’s onward. These early aircraft typically cruised around 60 to 100 miles per hour. 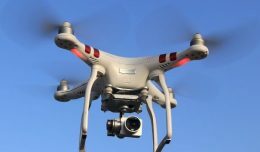 The low performance air-cooled engines powering them had little problems with heat, and the engines were exposed to the atmosphere without restriction to aid cooling. In fact, the only problem typical to these engines was excessive cooling in cold air. As designers pushed aircraft speeds past 100 miles per hour, the drag caused by these exposed cylinders became rather formidable. An early aerodynamic device used to lower this drag was called a speed ring – a gently curved cover that cupped the tops of the cylinders for the entire circumference of the radial engine. The speed ring was good for a 5-10% increase in cruise performance and was common on the biplanes of the early and mid 1930’s. As aircraft designers pushed further for greater speeds, it became necessary to reduce the drag of the engine substantially. Engine manufactures were also facing new problems as the higher performance engines were generating heat that was no longer simply dispelled by simply exposing the cylinders to the atmosphere. The pressure cowl was developed, entirely shrouding and enclosing the engine. Limited airflow was directed at the cylinders with baffling further focusing the cooling and reducing needless bypass and drag. 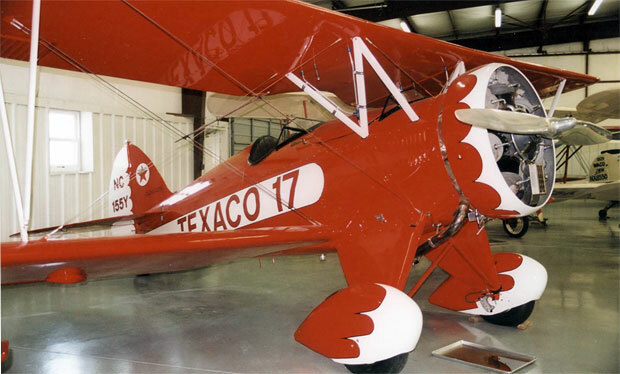 This eventually allowed piston powered aircraft to achieve speeds of over 400 miles per hour and provided the cooling required by the large high performance engines. Though inferior to the open (or no) cowl on the ground and at speeds below 70 miles per hour, this design not only reduced aerodynamic drag, but also improved cooling at speed and allowed a more even cooling to the engine’s heads and cylinders. 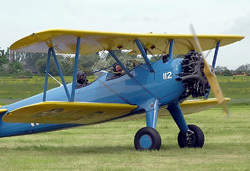 The pressure cowl was used for radial, inline, and flat boxer-style engines and remains to this day in air-cooled piston powered aircraft manufacturing. With the advent of the turbojet engine, engineers faced new problems. Heat dissipation was no longer a problem for the cowling designers, Naturally, the cowling needed to be aerodynamic as the turbojet is most efficient at speeds approaching mach one. But there were three other problems new to turbojet cowling; it needed to deliver a smooth turbulent free airflow to the engine at low speeds, subsonic airflow at high speeds, and not generate excessive mach drag. Engines on a classic 707. Blunt and linear surfaces on a jet aircraft create mach drag as speeds pass sixty percent of the speed of sound. Sharp leading edges and swept surfaces, like the wings, reduce this kind of drag. Early engine nacelles had sharp leading edges as well, which along with radically swept wings, suited the turbojet’s pension for better performance at high mach speeds, and met the desires of the traveling public. In the 1960’s when these aircraft were made, speed was a selling point. 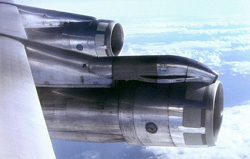 This type of cowling is evident on the early 707, DC-8, and Convair 880 aircraft. As the aircraft accelerates into mach speeds, there is another requirement of the cowling that is absolute; it must deliver subsonic airflow to the engine at all times. 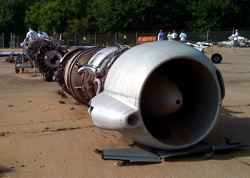 If the turbine were to ingest a supersonic airflow, shock waves and the associated expansion from them in the compressor section would cause a compressor stall, with immediate and serious engine damage likely. Though the jet aircraft itself is traveling below the speed of sound, there are areas in which the airflow is accelerated to supersonic speeds as it flows over and around surfaces. A shock wave is formed when this supersonic airflow is returned to subsonic speeds. The general presence of the cowling facilitates the formation of a shock wave ahead of the engine, as well as the blunt spinners on the early jet engines, which at the time often contained the starter/generators. A flat, blunt surface is likely to cause the formation of a shock wave, with subsonic airflow behind it. These early spinners were the last line of defense for maintaining a subsonic airflow into the engine for aircraft there were routinely achieving speeds of .90 mach. 707 engines, minus the sucker doors. As turbojets gave way to the more powerful and efficient turbofans in the 1960’s, the cowling design needed to change as well. These new fan engines processed far more air at low airspeeds, resulting in more thrust. 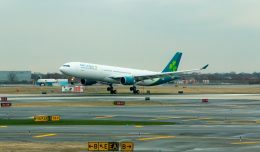 During the early stage of the takeoff run, the turbofan will pull in air from both in front of it, and from behind it. Up to an airspeed of around 80 knots, air will flow forward around the engine cowling, and reverse direction as it wraps around the leading edge of the cowling. A sharp leading edge will cause a disruption as eddies form; this turbulent airflow causes stress on the compressor blades, and may even cause a compressor stall. A fat and smooth leading edge would eliminate this, but create excessive drag at mach speeds. The answer, at the time, was to maintain the sharp leading edge and add spring-loaded doors just behind it. This allowed air to bypass the normal route of going around the leading edge, and provided a satisfactory airflow to the engine at low speeds with high power settings. Commonly referred to as “sucker doors”, they can be seen on late model 707’s with the (at the time) high bypass fans, early 747s with the JT9Ds, and others. As more became known about high speed aerodynamics, wing design changed. Wings could now be designed with round and more blunt leading edges without the typical high-speed drag associated with them. 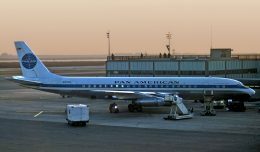 Aircraft design in general also changed as cruise speeds dropped for better fuel economy. Engine cowling design followed suit with blunt leading edges that provided a proper low speed airflow, without the high speed penalty. These blunt leading edges would also create the required shock wave if speeds were to get excessive. This then enabled engineers to redesign the spinner. The modern spinner is pointed and out-of-round. Ice formation is focused on the tip, and it is then immediately shaken off. This passive deicing is in contrast to the older spinners that require heating, often from engine bleed air, reducing both power and efficiency. Though you are unlikely to spot an aircraft with sucker doors any longer, you can still see the evolution of the jet engine cowling at the airport. You may see the changes from early production to current production airliners as the cowling leading edges became more blunt and the spinners became more pointed. The Embraer 190, one of the most modern designs, is rather extreme in this regard. Even on aircraft that use the same engine, you may find wildly different cowling designs, based on the manufacture’s desires and limitations. The CFM56 is found on the B737, A320, and A340, yet each cowling is radically different on these aircraft with this engine installation. 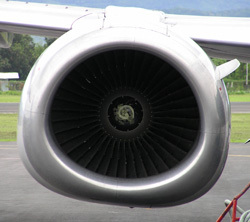 So during your next flight, or your next visit to the airport, pay regard to the cowling on the engine. It is far more than trimming and an enclosure for the engine, it is as critical to the design of the aircraft as the wing. David J Williams is a former airline Captain and currently involved with aviation safety. I read this article with excitement. I am a cowling geek. I look at the type of aircraft coming in, say, then take a long glance at the cowling. Weird, no? A strange bit of quieting functional sculpture (engineering art?). Anyway, if I was a multi-trillionaire I would operate a cowling museum from before the Naca into today’s GEnx. Not a fan, no pun ‘tended, of the RR cowlings but the one used on the 734 is one of my favorites. Is there a general text on cowling design for modern airliners as far as you know?